The ScummVM DS lets you play plenty of click and point adventure games that were released from the 80s and 90s on modern PCs. This application can run games from Lucasarts that have been created with the use of the SCUMM system but at the same time, it can also expand and run games created by other developers as well. It is written in the portable C++ and can be transported to various platforms. 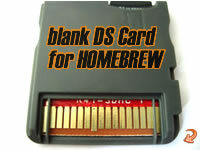 This lets you enjoy classic games on your Nintendo DS and with full sound at that.